This chapter is an interlude before the last trumpet. John sees an angel come down from heaven. I’m confused – haven’t the last few chapters taken place in heaven? 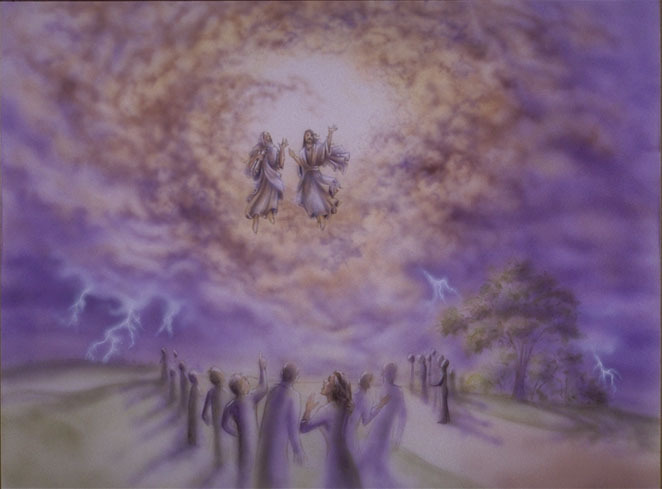 John was up there viewing the throne of god so I assumed he was watching all the action, like the destruction on earth, from up in heaven. Now he seems to be back down. This is kind of like the Wizard of Oz, where the scenes switch from Kansas to Oz, and then back to Kansas again (and it’s about as believable). Anyway, the angel stands with one foot on land and the other in the sea, roars like a lion, and then seven thunders answer. John doesn’t write down what they say, though, because god yells down from heaven and tells him not to. 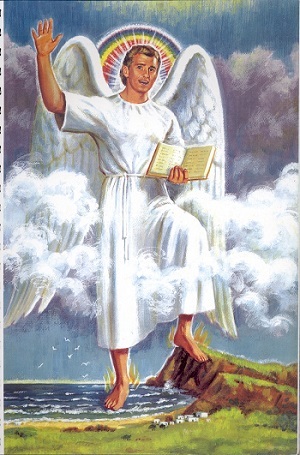 The angel becomes impatient, raises his hand to heaven, and swears to god that there will be no more delays; when the last trumpet sounds, god’s plan will be fulfilled as spoken by the prophets. God will appoint two witnesses, wearing burlap, who will prophesy during that time. 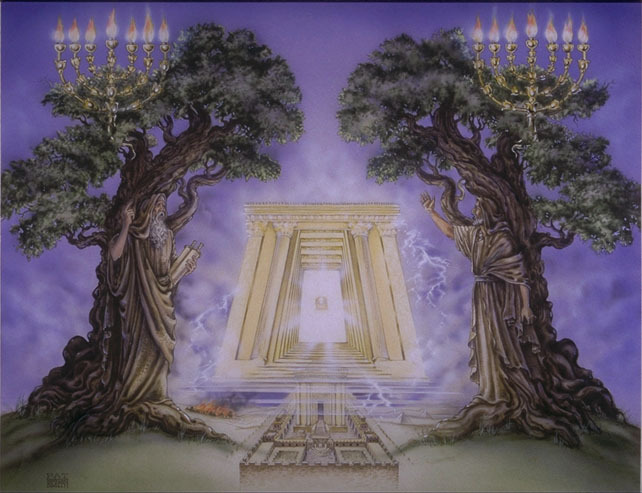 But then god says that the two witnesses are actually two olive trees and two lampstands. How is that possible? This makes at least 4 items, and trees and lampstands don’t wear clothing; to me it sounds like six individuals here. It’s very confusing; but then it was confusing back in Zechariah 4, too, which is where John took it from… Don’t try to harm the witnesses or they will spew fire from their mouths and burn you. And they have the power to cause droughts, turn water to blood, and strike the earth with plagues. After the witnesses complete their prophesying, a beast will arise from the Abyss and kill them. Their bodies will lie in the unnamed ‘great city’ where the lord was crucified. This city is also referred to ‘spiritually’ or ‘figuratively’ as ‘Sodom’ or ‘Egypt’ – is that supposed to imply that those places are synonymous with evil? The NLT infers that the ‘great city’ is Jerusalem, but original Greek doesn’t say that, and it doesn’t refer to Jesus by name, either, just ‘the lord’ or ‘christ’. For 3 ½ days, the bodies of the witnesses will remain in the street so that people can gloat over the death of the prophets who had tormented them. But then all of a sudden, god resurrects them and takes them up to heaven in a cloud, scaring the bejeezus out of everyone who is watching. Voices shout praise in heaven, and the 24 elders join them and pray that god will reign forever. They claim that Judgement Day has arrived, where the faithful will be rewarded and those who caused destruction on earth will be punished (wouldn’t that apply to god himself?). There’s a thunderstorm with hail and another earthquake, and in heaven the temple is opened to reveal the Ark of the Covenant.